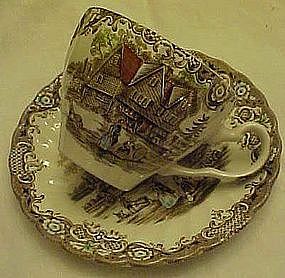 A matching cup and saucer in Johnson Brothers Heritage Hall pattern made from 1969-1985 in England. Various country scenes on different pieces to the set. Cup and matching saucer is in perfect condition with no damages. I have 8 perfect sets available. Price is for 1 cup with saucer. I will be listing more pieces of this wonderful pattern.